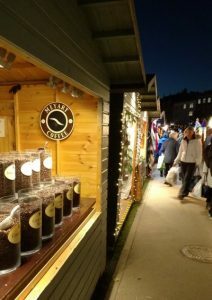 After recently updating the Exeter shopping areas’ page, we’ve now also updated the Exeter Markets section that includes the Christmas Market highlighted here today. Throughout the year Exeter hosts many markets at various venues within the city from modern street food and car boot sales to traditional street markets. Although these are popular throughout the year, none offer the glitz and alluring setting of the very popular Exeter Christmas Market that’s held on the Cathedral Green! You can find out more information on some of the market days available on the Exeter What’s On Calendar.